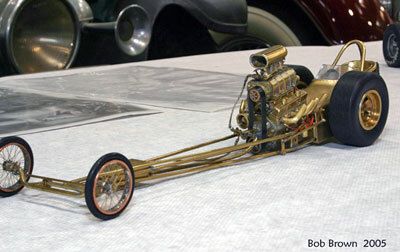 In September of 2004 "Big Yohns" commissioned a one-of-a-kind brass model of his Shubert/Herbert dragster. This page will follow the progress of the builder, Roger "Riceman" Lee. 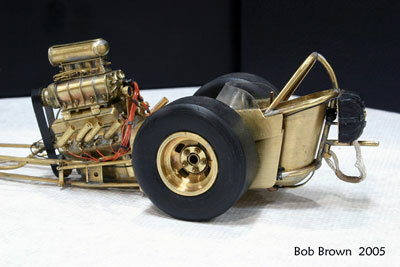 He has built numerous models of race cars in the past, but possibly not one which is as well documented as this project. Photos are accompanied by commentary from Lee. 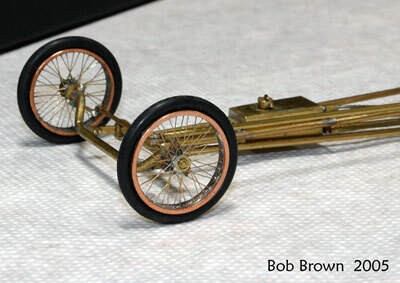 When you want to start building a chassis you must have some idea what scale you are about to build, obtain the chosen scaled engine, rear axle (unless to plan the make one out of brass or plastic), rear tire diameter and some way of making a drive line. I always buy more than enough brass tubing, rod ,sheet and piano wire. 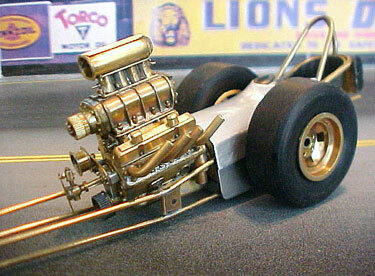 I want to thank Fishtanks for sending me the 1/16 265 Small Block Chevrolet block and heads. This may seem extreme and I just so happen to have a complete gasket set for a SBC and a 350 cu. in. SBC in my garage. I'll use this for dimensioning sizes and replicating bolt locations on the now assembled 1/16 SBC long block. I made the Oil Pan out of .016 brass sheet ( 8 pieces ) with a 3'' piece of 1/8" brass tubing representing the driveling from information provided by Ron "Big Yohns" Johnson, the car owner. I assembled the block and heads with double sided tape for right now. 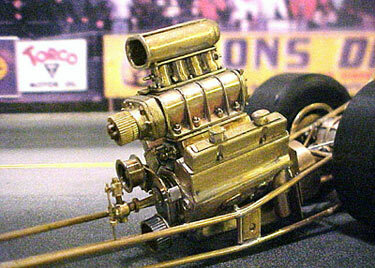 You need to make a Motorplate 1/4 x 20 wide x 24'' high in scale. To make the edges perpendicular and if you don't have a square, use a CREDIT CARD edge to scribe out the motorplate. I made one from .016 brass sheet. Flatness and squareness of the motorplate is critical! Debur all edges and holes. Scribe a vertical centerline, a 3/32" wide vertical line on each side and the distance, 1/8'' below the bottom of the oil pan to the crankshaft centerline and drill a 3/16 hole at the intersection of the centerlines. Position and attach the motorplate to the block with double sided tape. 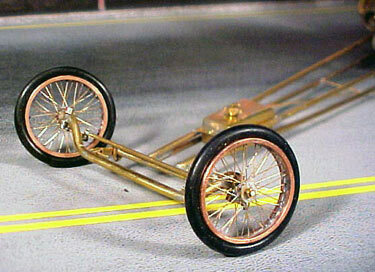 This can be the start of a Dragster, Funny car or Fuel Altered chassis. I stopped at 3 am and this is what was made. This was the easy part. I might lower the motor some more. Here is a picture of the roughed out drive line. 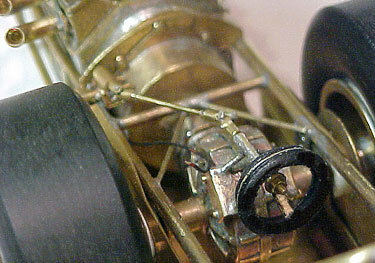 The ribbing on the rear end housing still has to be done along with the clutch can details. This is the same shot, but with the rear section of the frame. After seeing what was available for a 30-10-15 M & H slicks and 15 x 10'' small hole Halibrands wheels, ZERO, and it was time to create. The Slicks were made from 2 pieces of Black Delron 1 7/8 x 3/4 with a 15/16 hole. Using a 1'' sanding roll arbor and a hand drill, the with the soon to be slick mounted on it, I shaped the side walls scraping the Delron with an X-acto knife to match the side wall pattern made from brass sheet. 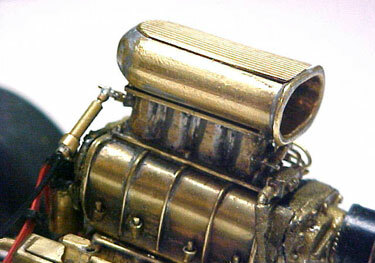 The Halibrands started with two brass hose end sleeves that measured 15/16 outside diameter with a 1/16 lip on one end. I made 4 rings of .047 brass rod and soldered one ring to the outer edge of a .190'' width cut down sleeve to make the bead edge and second step of the wheel. 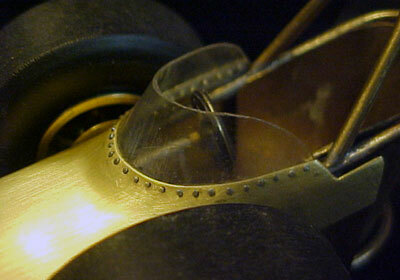 I filed down the outer edge of the soldered ring flat to create the bead edge of the wheel. Then I made using .016 brass sheet, the raised 7'' lugnut centers and drilling 5 lugnut holes and center hole were made. The wheel center was made of the same material, drilling and filing 4 rectangular slots and a 3/16 center hole. I shaped a bowl 7/8'' diameter by 1/4'' deep on a piece of wood 2 x 4 and formed the wheel center using the ends of 3 different size of rounded file handle ends. I soldered the 7/16 lugnut face to the center piece, drilled the lugnut holes through and then soldered the center to the rim piece. Using the remaining pieces of the brass sleeve, I soldered a other .047 ring to the outer edge, filed the edge flat and cut the brass sleeve down to make the inner part of the rim. The valve stem will be made from .020 brass rod and a 1/32 sleeve of tubing for the valve stem nut. A total of 8 pieces for each wheel. Well lets take a lookie at it. You said that the tallest tire this car ran was 30'' on diameter, a shorter tire would put the shoulder tube higher and the rollbar-shoulder hoop intersection farther back. Now add the interior on top of the shoulder hoop which adds height and makes the rollbar looks shorter. Maybe I'll just stick a 2 x 4 under the bottom seat tube and kick the rear up a tad. I got out my mini sawsall, 2x4, heliarc and made the adjustments. The shoulder hoop now is at a scaled 32'' with a 30'' tire. I cut the rear rollcage tube 1 1/2'' shorter and shorten the rollbar hoop 1''. Better ? Now you can bring the recreation up here and we'll make the ''adjustments". I just completed the Fuel Tank with the Cap and Vent Tube. 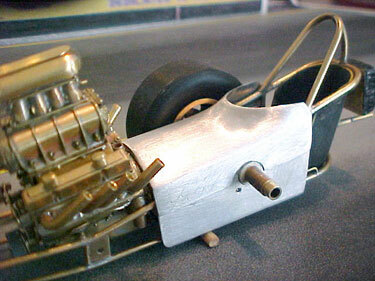 The tank body was formed from .016 Brass sheet, shaped, soldered the edge and cut to length. Then I soldered the tank body end on to a strip of .016 brass, cut and filed to the shape of the fuel tank body on both ends. I pre-fitted the fuel tank in the frame and scribed a line on both ends for the mounting flanges that were made from .090'' strip of .016 brass. A .032'' hole was drilled and countersunk in each flange for the 000-120 countersunk flathead slot screws that will be representing Dzus Fasteners. 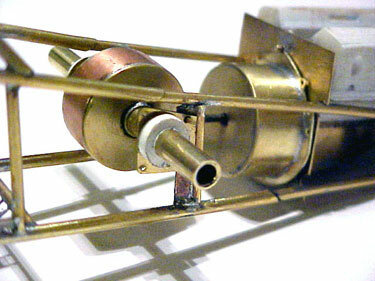 The Cap and vent tube was made from 7 pieces of brass tubing and soldered to the top of the fuel tank. 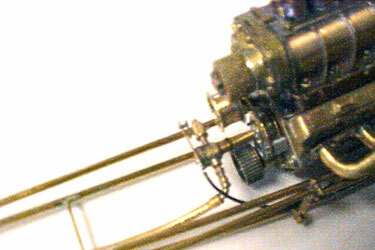 A piece of 3/64 and 1/16 brass tubing were soldered into drilled holes for the main and return fuel lines. The tank was finished with 1000 grit sand paper. 14 more brass pieces were added to the list. I made the SBC block & heads out of brass. I still have to sleeve the block. 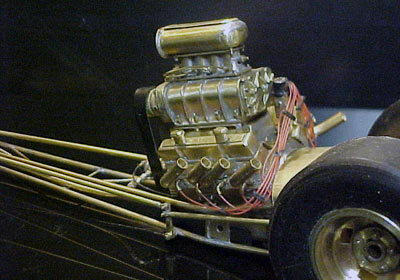 Here is the Nitro SBC for the 1/16 replica of the Shubert & Herbert done in brass. The lower head bolts, spark plug holes and Zoomies are next. 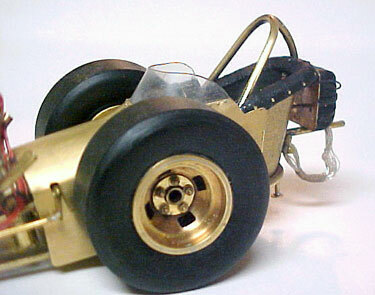 Here is the Nitro Mouse with zoomies and head detail. I started with making the flanges three times till I got them right. Too thin of material, then they were too long, and I went looking for pictures. 7 hours later they are done with 22 more pieces ( 2 Flanges, 8 tubes that were bent, and 12 simulated header bolts added to the last. The lower head bolt castings and the so called head bolts took 32 pieces of brass tubing and rod. 13 hrs today on the SHU-HER-BERT, I am punching out today. This shot is just to graphically illustrate the scale of the model. I ran out of Brass paint! LOL Well the 500 piece mark has been reached. 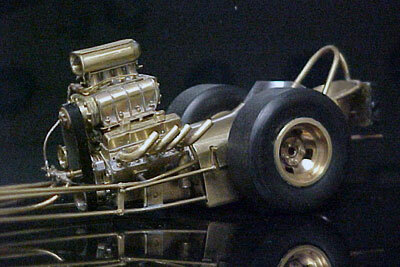 I thought thing car was going to be a piece of cake, but you only as good as your last win or in this case, Replica. It looks so Bitchin! 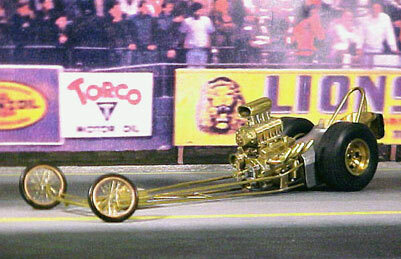 In the pass I made all my Dragster bodies out of .016'' brass sheet. With the Shubert & Herbert AA/FD it was time to go for the Aluminum. Using .020'' 3003-H14 aluminum sheet with a few bruised fingers and cuts it was done in 6 hours. The four body panels were made starting with the belly pan, then the side panels and the most challenging, the Cowl with its compound curves. I started with a 3 x 3'' piece of 3003 with a 5/8" U cut 1.250 deep along the centerline off of the rear edge. I filed a 1.250'' U shaped grooved radius along the edge of a 2x4 piece of hard wood and with a 1/2'' steel rod to hammer out the windscreen radiused base working along the U shaped cutout. Slap Hammering and rolling methods were used to hit the in the way finger tips and aluminum sheet. Once I regained my feeling in my finger tips, the top of the cowl was formed over a 1.5'' piece of aluminum rod and then the sides were bent to the width of the mounted side panels on the chassis with double sided tape. The cutting and fitting of all the edges was the next step to match the Shubert & Herbert body. Deburing and sanding was the next step. Dzuz fasteners are yet to come. Hey, is this how Tom Hanna or Ron Covell started? Dzus Fasteners in 1/16 scale ? Are you nuts ? I will be using 000-120 Stainless Flathead Slot Countersunk x .090 length screws that will thread though soldered brass strips on the chassis, drilled, and 000-120 tapped for the wire clip Dzus panels. The finished aluminum body made from .020 3003-H14 aluminum sheet. 10 HRS of fun to build? The final results are always satisfying. The rims are 1.00 x .044 wall copper tubing cut, hand sanded to .068 +/-.001, then finished with 1200 grit sand paper and deburred. 4 pieces The bearing spoke spool was made from 3/32 brass tubing with a .190 diameter disc x .016 brass soldered on the end. A 1/16 center hole was then drilled. Another 4 pieces were made. The spokes are .008 brass wire that was hand wound around a 10 - 1/8 diameter pin pattern applying 1/4 pound of tension with each spoke. Two halves make one wheel that were soldered together with a lower temp solder so the silver soldered 40 spokes won't come apart. A center groove was then filed for the tire O ring. 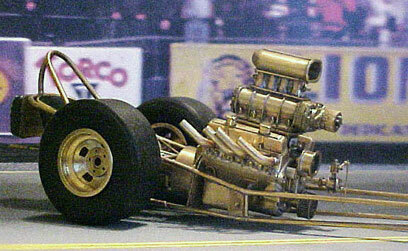 Semi-finished car staged in a Lions Drag Strip setting. Well, I just pass the 600 pieces. I am currently working on the fuel lines. The main fuel line took 17 pcs. 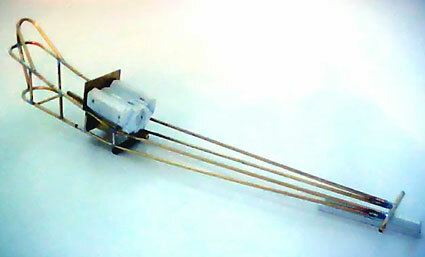 The drag link, windscreen, fuel tank secured with 2 Dzus fasteners ( 000-120 stainless slotted countersunk screws ) and the second body constructed due to recent pictures that showed the rear part of the body. Those famous words from a known recreator," if it looks right, it has to be right ! " So after building the second body for the car, the rollcage came off, again for the third time, because it didn't look right comparing the replica to recent picture that appeared on the Standard 1320. The rear single tube was shorten another 1/8'', the front hoop was shorten 3/16'' and moved toward the rear of the frame 3/16'' and resoldered. Such little changes when coming together make such a big difference. 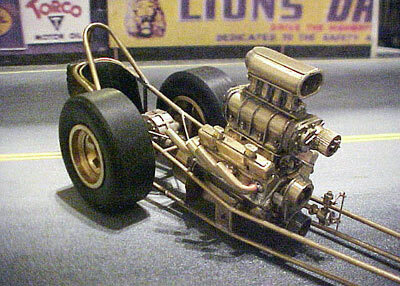 The Hilborn Fuel Injector Brain started out with .093 x .015 wall Square Brass Tubing. 4 pieces, 1/2'' long of .032 x .007 Brass Tubing were cut and the ends were deburred. Two pairs were soldered together on one end, flux was applied on the soldered ends and inserted 1/16 into the end of the .093 Square tubing. Heat from the Soldering Iron Tip was applied to the end of the square tubing till the pre-soldered inserted 4 tubes turned copper color which means there was enough heat to join these 5 pieces together without solder showing on the outside. Using a .005 thick razor saw I cut a line 1/32 away from the end of the Square Tubing around the 4 tubes so it represents the nut and hose end fittings of the nozzle fuel lines. The 4 tubes were sawed off to a length of .090'' from the edge of the Square Tubing which will be the main body of the Brain. Two .033 holes were drilled into the front face of the F/I Brain,1/16 apart and from edge. The right hole was drilled though the back face. 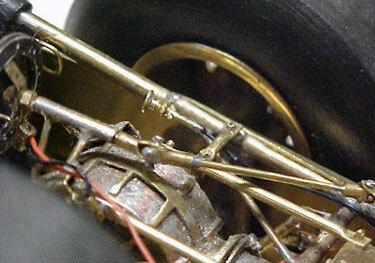 Two pieces of 1/32 x .007 wall tubing was tinned with solder and inserted into the drilled holes. The right side tube was pushed all the way though with 1/8 '' showing out the back face. 3 pieces of .047 x .007 wall brass tubing, cut and filed to .010 thickness, tinned with solder on one side were pressed over the two front face tubes and backside tube with the soldered side against the Brain Body. Heat was applied at the bottom of the Brain Body till the tinned side of the .047 tubing melted against the Brain Body. The two front pieces of .032 tubing coming out of the front face of the Brain Body were cut off and filed down so just .015'' was exposed out of the .047 x .010 thick tubing. Now the front face of the Brain body has the 2 casted machined area with plugs where fuel return lines would go and the backside has the raised machined area with the throttle linkage shaft coming out and cut/deburred to 1/16'' long. The Brain body is now cut to length. A piece of 1/16 x .015 wall tubing was tinned,coated with flux and inserted into the right end of the Brain Body.Heat was applied to the 1/16 tube till the solder flowed, joining the two pieces and cut off so the 1/16 tube is .032'' exposed out of the Brain Body. This is the inlet side where the fuel line comes from the outlet side of the fuel shutoff valve and fuel pump. I used a strip if .016 brass x 1/16 wide, drilled two .033 holes 1/8'' apart, bent over one end over one of the holes, drilled through that and sawed off the folded end of the strip to a 1/16 square. 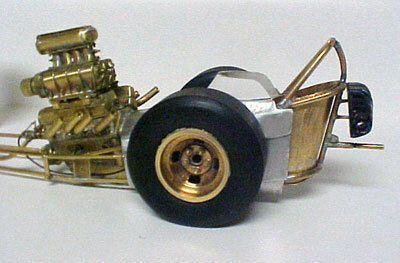 On the other end, a tinned 1/32 x .007 wall tube was pressed on the other drilled hole, soldered into place and cut to 1/32'' long The strip was trimmed to the edge of the tube, a radius was filed around the tube and now filed into a tapered shape between the .033 hole and 1/32 tube. One throttle linkage arm done.The arm was pressed over the shaft coming out of the backside of the Brain and soldered into position. The F/I Brain is now soldered on to the front plate area of the fuel injectors. Another linkage arm will be made, the link between the arms and attached together with .020 brass rod to simulate the pivot linkage bolts. 13 pieces for the Brain and one linkage arm with 8 pieces to go to complete. If you keep looking at pictures long enough, the unseen details come out and the position of things. I made some rear chassis adjustment and repositioned the seat deeper into the chassis. I shortened the rear seat upright 1/8'' ( 2'' ) and raised the bottom main rail along with shortening the rearend uprights and the uprights at the front of the seat. The bottom seat support was also rebuilt. The rollcage was changed again moving the rear vertical tube forward at the top and shortening the hoop 1/16'' changing the angle a bit. 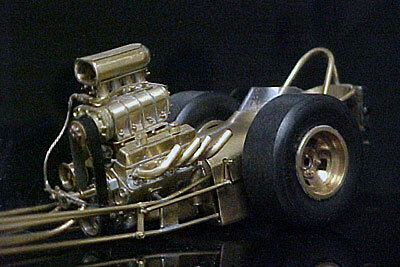 The decision for the Shubert & Herbert Replica is to remain in it's Brass form. I made another body out of .016 Brass sheet. 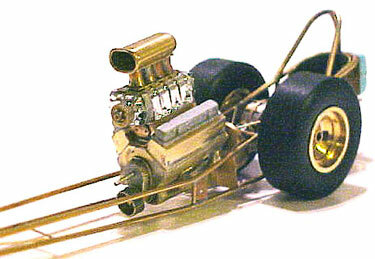 As said before, the body will mount to the chassis with 000-120 flathead countersunk screws to replicate Dzus Fasteners. 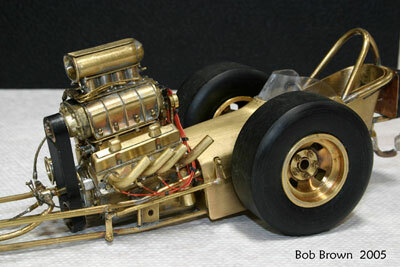 This is a 1/16 scale Replica of the Shubert & Herbert AA/FD in Brass Form. 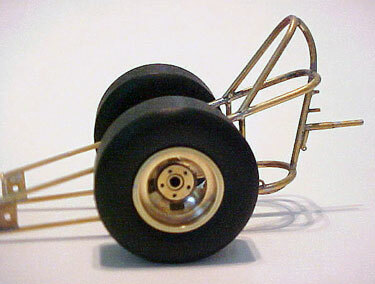 The slicks are made from Black Delron Plastic. Under Construction still at 674 handmade brass pieces. I first drilled 4 holes, .021'' diameters into the injector body. Then I soldered in .020 brass rod into the holes, cut and filed the ends flat to 090'' length. Using .032 x .007 wall brass tubing, I cut off 8 pieces off at .075 long. 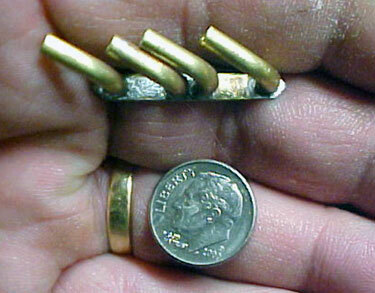 With these pieces, 4 offset "T " pieces were soldered together. 4 Lengths of .020 brass rod was formed and inserted into the 4 tubes coming out of the Injector Brain, cut to the correct length, then the base of the "T " were inserted over each .020 rod coming from the Brain and pressed over each .020 rod extending out of the injector body. The fuel lines are done. 16 pieces of brass now bring the total parts to 671 ! I had to take a few days to think about how I was going to make the two universal joints for the steering connecting the steering wheel to the steering box. This used up some more brain cells. WARNING, do not try this at home ! I first cut a slot 1/8'' deep with a .005 razor saw into the end of a piece of 1/16 x .007 wall brass tubing. I then placed the tube on a flat surface and with an X-acto knife I worked it into the cut slot. Pressing down, I flattened one side, rotating the tube to the other side I flattened that side which created the two ears for the universal pivot shafts. I clamped the tube into my small vise, inserted a short length of .047 brass rod into the tube so the ears would not collapse and drilled into the center both ears a .021 hole. I then shaped the ears to the edge of the .047 rod, and cut off the universal end .090 long from the ear slot. 4 pieces were made. 4 pieces of .047 ! x .007 wall x .090 long brass tubes were soldered into the ends of each universal. I found some .045 diameter black plastic wire insulation and inserted it between the universal ears. Using the .021 drilled holes in the ears as a guide, I drilled though the plastic insulation, inserted a short length of .020 brass rod though the holes to secure the plastic tubing. I then cut the plastic tube off 1/32 longer than the ears and pressed another universal end into the slot and plastic tube. Again using to holes in the ears as a guide, I drilled though the plastic tube behind the first inserted .020 brass rod and inserted another short length of .020 brass rod. I cut off the excess lengths of the .020 brass rods, filed the ends flat and touched the ends with my soldering iron, leaving a spot of solder on the ends so the .020 brass rods would not come out. ONE DONE and IT WORKS ! 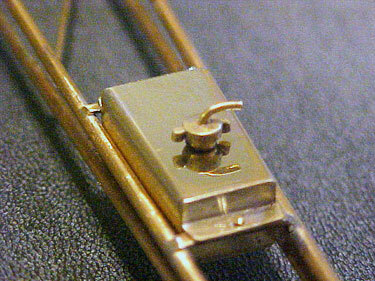 I soldered in a 1/4'' length of 1/32 brass rod into the end of the universal which went in! to the steering box. 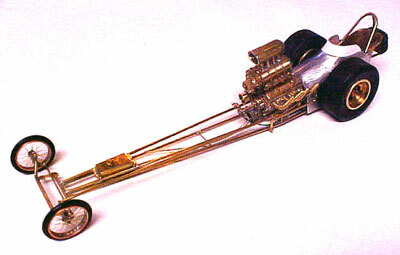 The steering shaft mount on the rear axle housing was copied, a short length of 1/32 brass rod with a 00-90 stud soldered to the end was inserted into it and pressed the other universal joint over the other end of it to check the length of the shaft. 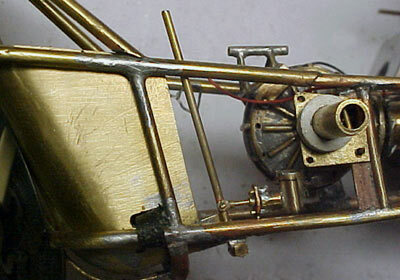 The length between the two universals were measured, a piece of 1/32 rod was cut to the needed length and on each end I soldered on the universal joints. I reinserted the shaft of the steering box universal into the steering box, position the second universal in line with the steering rear end shaft mount tube and pushed in the steering wheel shaft. A mocked up steering wheel was made to check the positioning. The steering wheel is next to make. This was a real brain burner, but the results were were satisfying. The Windscreen on the Shubert & Herbert AA/FD is one of the unique parts of this car being taller so "when" the motor starts blowing oil out, it went over Zane Shubert's head and not get in his beard. Well that is what he told me. I laid in strips of double sided tape inside the cowl drivers opening. I position the tape to achieve the right lay back angle at the front and even radius to follow the opening. I then cut a line 1/8'' below the the top edge of the cowl opening, trimmed the top edge to the correct height and radius cut the ends. The cowl was then placed on the car to see if the "Look" was correct and trimmed if needed. The windscreen pattern was then placed on some .010 clear plastic and cut out. With a .020 drill, equally spaced holes were drilled along the edge of the cowl starting at the front and drilling opposite sides every other hole. 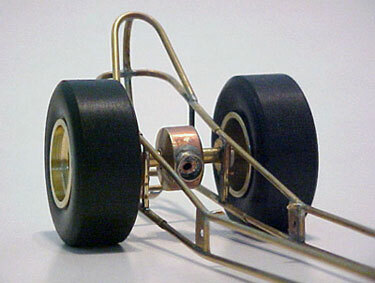 The windscreen was taped in position, following the drilling pattern as before, drilling through the windscreen and inserting .019 brass rod x .250 long. Once all 32 brass rods were coated with solder 1/8'' on the outside, they were press into place and super glue on the inside of the windscreen and the excess rod was cut off. 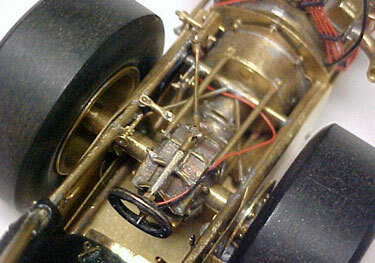 All the exposed outer ends of the windscreen '' bolts'' were filed down to .010 height and deburred . It was time to add some SPARK to the motor. I went over to Potvin Doug's house and checked out the Vertex Magneto on his dragster to get dimensions and wiring pattern of the cap.Thank you to all that responded to my questions about the details. Starting out with .250 x .015 brass tubing, I turned down the diameter down to the scaled 3.750'' (.235 o.d.) and cut the length off at .350'' for the main body. Then I scribed a line .032'' from each end. This piece was slipped over some .218 x .015 x.350'' length brass tubing and then a piece of .187 x .015 tubing that extended out of one end .125'' for the cap. Pieces of.156 x .015, .125 x .015 x .475'' length were used to reduce the inside diameter and the last piece of .093 x .015 x .625 long tubing was inserted extending out of the other end for the bottom part of the magneto body stem. I soldered all these pieces together filling the top of the cap end and filed flat. I then cut a .020 ring of .125 x .015 tubing, slipped it over the base end .080 from the main body and soldered it on for the Magneto lock clamp. A .020 hole was drilled in the side of the body for the Mag wire and inserted a short length of .019 brass rod for the mag Wire stud. Two rows of 4 @ .020 holes were drilled into the side of the cap and 3'' long lengths of .018 dia.orange coated wire were glue in each hole. Since # 1 wire was located at the 4 o'clock ( looking at the Mag from the top), each wire was positioned by firing order. I needed to make some spark plug wire looms out of black plastic.....AH ! A 3.5'' Black Floppy disc case was cut apart, a straight edge was cut and filed flat. I scribed a centerline .020 parallel to the straight edge, drilled .020 holes along the centerline and sawing off pieces at .040 wide with 4, 3, 2 holes for the looms. The ends of each loom were deburred and radius. 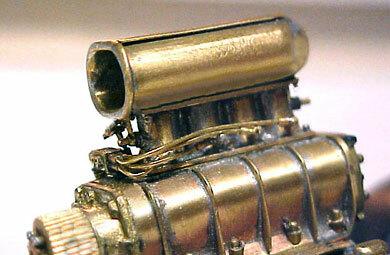 The spark plug wires were then slipped through the looms, positioned and super glued from underneath. The cylinder heads were drilled and tapped with 00-90 threads for the mounting studs ( aka spark plugs) and 90 degree Boots made from .047 x .007 wall brass tubing, tapped 5 rotations leaving a tapered threaded end, bent 90 degrees and cut off to .062 long. These were screwed into the spark plug holes. 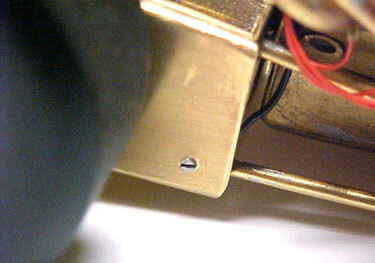 The Magneto wire was made from .018 wire, pressed flat one end, a .020 hole was drilled through the flat end, filed into a wire connector loop and soldered on to the Mag wire stud. Starting with # 1 spark plug wire, each wire was position in its firing order, cut to length and glued into the spark plug wire boots. The cap was painted flat black, the 8 white numbered dots and the rotational dot were made by a few rotation from a .020 drill. I need a beer after this. No matter what scale recreation/replica you're working on, the right pieces make the car come altogether and satisfies the builder. 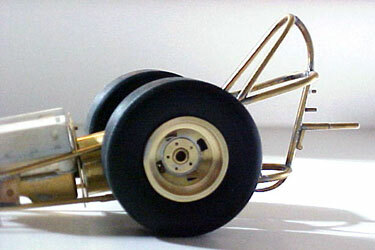 The parachute pack is the only production made part on this dragster from Revell's Miss Deal model. The size and the detail on it was more than I could wish for, almost. I first filed off the molded in parachute release cable and drilled a .015'' hole where the pilot chute loop would come out of the chute pack. To represent the stamped ring on the parachute flap that the .006'' brass wire pilot chute loop comes out of is a .005 thick ring of .032 x .007 wall brass tubing. 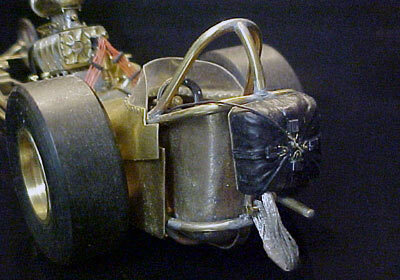 The release cable and housing was made from .008'' wire with .018'' diameter black plastic insulation. The end of the release cable was placed into the pilot chute loop, the ring was next for the loop to go through, which was pulled through the chute pack hole tight and super glued on the inside. The next things to add was the 4 elastic strap hardware which consist of the .006'' wire strap ends that clip over the attachments that are on the chute pack and the pull tab ears on the elastic straps which were made from .010 plastic strips. 16 holes at .010 diameter were drilled, 2 for each elastic strap end and 2 each for the 4 attachment clips on the pack. All the wire attachments were formed, put through the chute pack holes and super glued on the inside. The elastic strap wire ends were bent in a "Y" shape, then the ends of the "Y" were bent 90 degrees, the single end was clipped over the chute pack attachments and the two other ends went into the 2 drilled holes at the ends of the elastic straps and super glued on the inside. The 16 parachute strap lines were made from metallic/white thread, looped on one end, and the anchor end is tan painted masking tape . The strap lines were pulled through a .090 drill hole in the corner seam edge of the chute pack and super glued on the inside. So next time you pack a parachute, take a close look at the hardware and think about 16 times smaller. 34 pieces later. 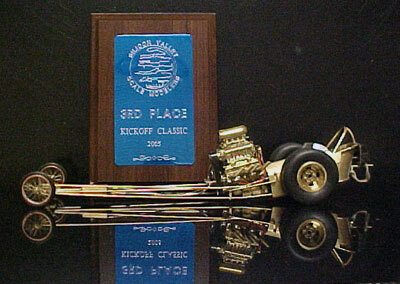 Last weekend (02-11-05) we went to the Silicon Valley Scale Modelers Kickoff Classic International Plastic Modeler Society Sponsored Show. I entered the unfinished Sherbet & Herbert AA/FD in the Open Wheel Competition Auto Class against all opened wheel racers. I was just showing for fun, looking and talking with other modelers there. 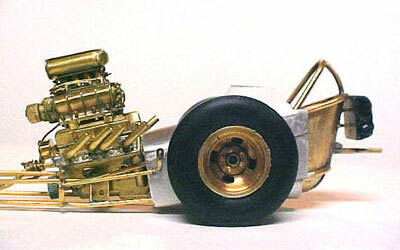 There were 6 F-1, 2 Indy Cars, 2 Belly Tank Bonneville racers and a model of the M & S 554 Coupe. in the class. Not only model cars were there, but models of military vehicles, airplanes, ships, space vehicles, and any other types of Plastic Hobby subjects you can build. The quality of these models are at a level where the models are looked at with flash lights ! One tough group ! 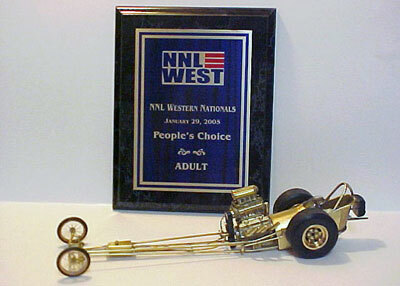 I talked with the head guy from the NNL West event and he told me that in the 19 years of the NNL shows around the nation, that the Shubert & Herbert AA/FD was the only "unfinished" model car to be voted as "People's Choice". 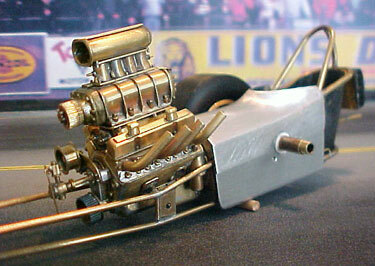 The master cylinder was made up with different sizes of brass tubing starting with .125 diameter and reducing to .032. Inside of the master cylinder body is a .008 wire spring that was made by winding around a length of .047 steel wire. Next I made a plunger out of .062 tubing and .032 brass rod. The spring and the plunger was then inserted into the drilled out .064 inside diameter master cylinder body. A piece of .062 x .015 wall brass tubing was coated with solder and pressed into each end of the master cylinder body, locking in the spring/plunger. A piece of .047 x .007 x .032 was slipped over the end of the plunger shaft and the same size piece was soldered on the end so it looks like a 1/4 heim joint and lock nut. The mount is made of .016 brass sheet with 3 holes drilled into it which the master cylinder presses into. The brake handle was made from .047 x .007 brass tubing wit! 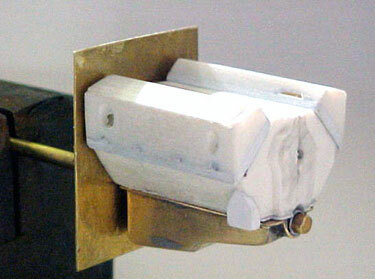 h a 00-90 nut soldered to the bottom end. A pivot bracket was then made from .016 sheet with a tapped 00-90 hole and solder in place on the chassis. I drill a .033 hole through the brake handle, inserted a piece of .032 brass rod , soldered it in the hole and cut it off to .075 for the master cylinder plunger shaft pivot. To put everything together was the tough part without everything falling apart, breaking and having the brake handle still able to move. I first positioned the brake handle pivot into the master cylinder shaft pivot and then aligned the the bottom of the brake handle to the chassis pivot bracket. I screwed in a 00-90 bolt into the bottom of the brake handle chassis pivot and through bottom brake handle pivot. It all works! I sure wish I could buy a 5-point seat belt set for this car, but that would be too easy. I went to a fabric store in search of seat belt material and found 3/16 wide cloth ribbon. All the seat belt hardware was made from .010 brass sheet. The slots for the belts started by drilling .032 holes for the ends of the 3/16 wide slots and then the remaining material was sawed out with a .005 thick razor saw. The slots was finished using a flat jeweler's file. I located and drilled a .020 hole for the buckle insert.The seat belt buckle T-shaped ends were cut out and filed into shape. 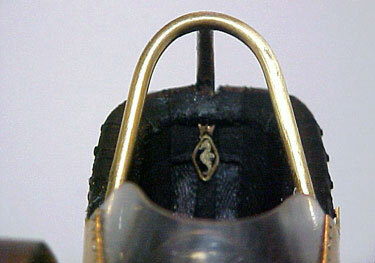 The shoulder belt adjusters have two slots each with an ear on both ends. I drilled a .033 hole into both ears for the belt adjuster bar. I then cut the adjuster out, shaped it, and then bent the ears 90 degrees to the slot base. A .025 brass rod was inserted into the ear holes to make sure the level of the ear holes were even and then cut and filed the rod to .225 long. 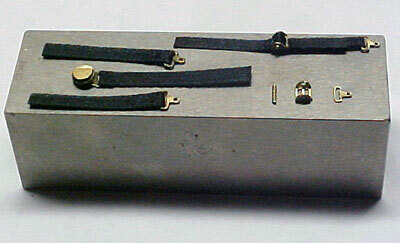 The lock-release buckle was soldered together using 4 different diameter disc of .010 brass sheet. I then assembled the belts and hardware together like a real set of belts. The shoulder adjusters work like real ones ! Three more pieces were made for the belt hardware that adjust the length and tighten the belts to the chassis. The belts in the picture are on a 3'' long block. 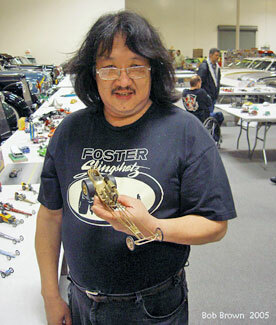 1-29-05: NNL West Car Model Show at the Santa Clara Convention Center. We took two cars to the show, the Loukas & Preising Fuel Coupe and the Shubert & Herbert AA/FD for it's first public showing. Both cars were well received and I was surprised on how many model builders have followed the progression of the S & H replica. 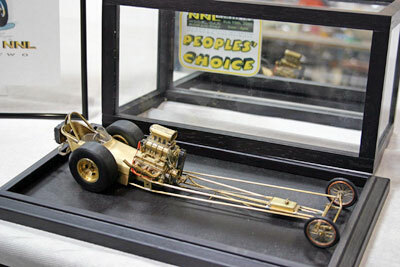 The only two awards give at this show are for "People's Choice" for the Junior and Adult model cars entered. There were 978 car models at the show. 03-01-05 - The Tony Nancy Interior started out with a plastic seat from the Revell 1/16 Tony Nancy Sizzler Dragster model. I reshaped the seat to fit into the brass seat insert and cut slots for the seat belts to go through. 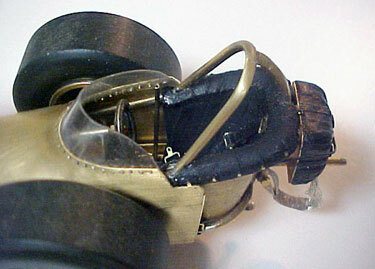 The seat belts are mounted and secured with brass seat belt hardware like the real belts. The top part of the seat that snaps to the top frame rail is a bottom of a plastic pill container that had a radius and its shape to fit perfect for this application. I filed grooves for the pleated sections. I then drilled .020 holes for the snaps into the seat and the frame tube, press in .020 brass rod, cut and filed down to .010 height for the snap heads. I added a special detail to the seat, and it is my tribute to Tony Nancy. 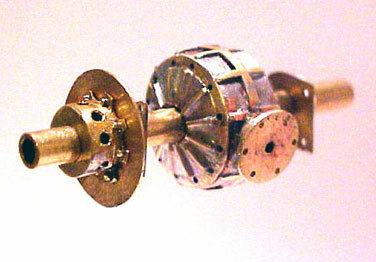 Side view of the snaps. The Tony Nancy Emblem was hand filed from 3 pieces of .010 brass sheet that was super glued to a sheet of black vinyl tape. I cut and removed the excess tape around the outer edges of the emblem and super glued the Tony Nancy Emblem in position. Here is what is under the cowl. The finished driveline struts, clutch pedal, throttle pedal with Moon linkage, mag switch & wires, brake caliper & brake line and fuel shut off cable assembly. 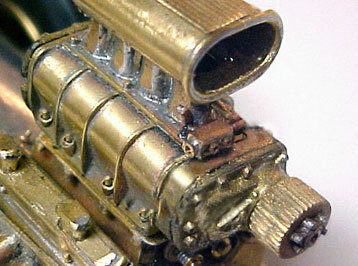 Fuel shut-off is made of 8 pieces of brass. The body panels are attached to the chassis with countersunk slot head stainless .038 x 120 screws x .090 long. 8 pieces of .020 x 3/32 x1/8 long brass strips were soldered on to the chassis with .032 drilled holes in the center of each piece. The body panel was then taped in place using double sided tape and then I drilled though the panel from the inside using the Dzus fastener plate as a guide. After all the holes were drill though the body panel, the panel was removed and all the Dzus fastener plates were tapped with a 000-120 thread. The body panel holes were then countersunk for the screws, positioned the panel on the chassis and screwed in place. This was one of the last 10,000 5 minute jobs. 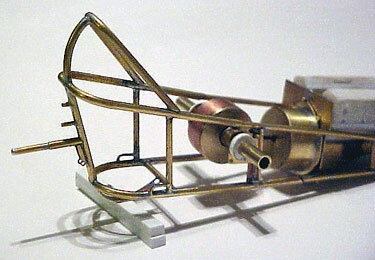 The moon throttle cylinder was attached to the pivot arm and the blower mount. I made a mistake and had mounted the arm to pivot the wrong way after seeing the recreation at the March Meet. So when I got home, it was corrected and the car is finally DONE! 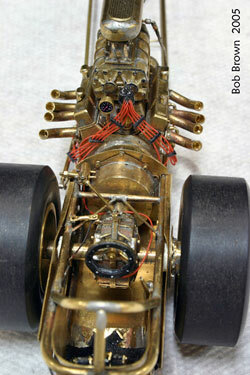 Final thoughts: In my 40 years of building car models, the Shubert & Herbert Replica has been my best effort to date. Obtaining the research of this car was as much fun as building it. I had the honor to talk with Zane Shubert at the CHRR last year and many emails between Big Yohns and myself. 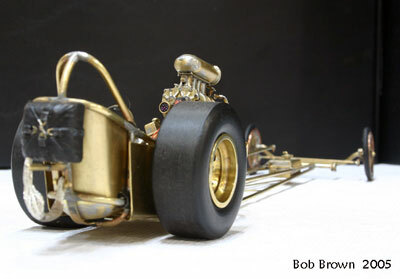 I wanted this car to be different and challenge myself to make a replica that hasn't been built yet in this style, all brass ( 94% ) , and of old world style of preserving a piece of history. 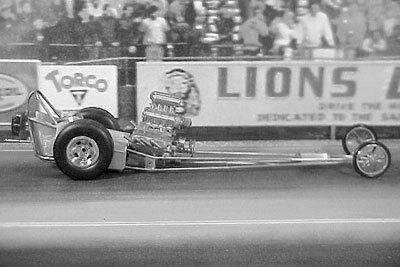 I want to thank everyone who help me create this Dragster, Ron Johnson for giving me the opportunity.